Kyle Gibbon's first endurance ride with Steve Rojek could well have been his last. Kyle, then 18, had already ridden endurance for 3 years, but he was used to his own paint horse and "little short-moving Arabs." And it had been a long time - 5 months - since his last endurance ride, when Kyle crossed the starting line on the Carolina hundred-mile ride on Steve's horse. Mel was an Arabian/Saddlebred cross, "a huge mover, very different - it was a different saddle, different pace - I was usually more of a conservative rider," Kyle says. "It was fast. And that horse beat me up! Every muscle I had hurt. Even every finger was bruised from the reins. Plus it was cold and raining. I was so glad when he was pulled at 75 miles for lameness, I crawled into the warm horse trailer and fell asleep. I was so sore I couldn't move!" But Kyle lived to ride again - the very next week - with Steve Rojek, on another of Steve's horses Julio, this time a familiar Arabian, to a first place finish on a 50-mile ride. It was the cementing of a successful working relationship with the Rojeks, which has led Kyle, now 21, to his first ride overseas in the Young Rider/Junior World Endurance Championship in Abu Dhabi on December 10th. "I owe it all to Dinah and Steve. All thanks goes to them." Kyle will be riding Steve's 16-year-old Arabian gelding Misu Koran in the 75-mile Championship in the UAE. Kyle's many years of riding experience since he was a youngster, his interest in jumping and showing, plus his 6 years and 5310 AERC miles of endurance experience will come in handy with Misu Koran. "He's difficult to ride. He's the most difficult horse we have. He's very anxious and uptight. Some days he is good... but most days he's hot." Kyle has figured a few things out about Misu Koran over their 2 seasons and 9 rides together, which include 6 Top Ten finishes, 3 hundred-mile completions, a Best Condition Award, and a Bronze Medal at this year's North American Young Rider 75-mile Championship in Kentucky. "We do a lot of cross training with all our horses - dressage, jumping, riding to the gas station and tying them up to stand and wait... but Misu's a little different. I don't treat him quite the same as the other horses. Despite his difficulty though, he's a sweet horse." The Pennsylvania native, who now lives and works for the Rojeks in Vermont in the summers and Georgia in the winters, crewed for Steve Rojek in the Pan American Championship in Uruguay in 2009, so he has some idea of the kind of international competition and flavor that the Juniors and Young Riders will face in the UAE Championship. "It will be interesting, and a lot different... It's desert - sandy, dusty, maybe even a sandstorm to deal with. There's driving around, tossing water bottles... (In the UAE, a crazy number of vehicles race over the sand alongside the riders and horses in the race, with crews passing water bottles through the car windows, or crews jumping out at regular intervals, handing out water bottles to riders on the fly, so the horses constantly have water poured on them.) But I don't think that will bother my horse." 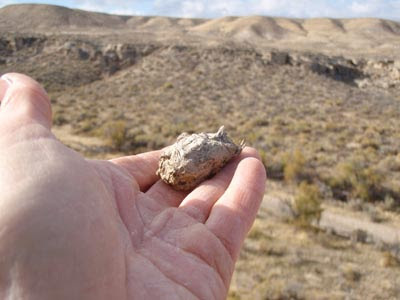 None of the adventure seems daunting, and Kyle feels fortunate to be participating in it. "I'm expecting we can do well; I'm hoping we can complete a team and maybe earn a medal. It will be so cool, meeting all these people from all over the world. It's going to be great!" The timing is a bit inconvenient for the Junior at Penn State University. "I leave on the 4th for Abu Dhabi, miss a week of school, get back on the 12th and have finals that week." But, Steven Hay, an environmental resource management and engineering major, is willing to make the sacrifice. He is one of four riders representing the USA in the Young Rider/Junior World Endurance Championship in the UAE on December 10th. "I'm terribly excited. I'm thrilled to have this opportunity!" Steven will say it's his grandmother who is ultimately responsible for this ride of a lifetime. "She always had horses; I always thought they were fascinating." He first started riding lessons when he was 6 years old. As his riding skills developed, he tried showing, but that was "not really interesting" to him. "A neighbor of mine did CTR (Competitive Trail Riding) and I tried that, and that led me to endurance." Steven's first endurance ride was in 2003, and since then, he's logged 2770 miles, including a 10th place finish in the Biltmore 100 in 2009 on his horse Twenty Four Carrots. It was their fourth attempt at a hundred together (they finished the Vermont 100 in 2008), and his most memorable ride. "We were on the last loop; it got dark, and our group slowed down. My horse went in front and picked it up and led the way in the dark. It was such a great feeling of having such a strong horse at the end of 100 miles. I didn't even know we'd finished 10th!" While Steven had always had an interest in riding internationally some time in the future, he never expected the opportunity to come so soon. Only a couple of months ago, he found out he would just make the age limit allowing him to compete in the Championship in Abu Dhabi this year (Young Riders are up to 21 years of age). And while he has his own horses, he couldn't afford to passport them; and anyway, none of them were quite up to the international level of competition. Enter fellow Northeast endurance rider Natalie Muzzio and her horse Khalil Asam. "I was talking to Natalie about it on the phone one day ... and, well, here we are!" Steven and Khalil had already gotten to know each other quite well after five endurance rides together over the last 2 years, which included 5 Top Ten finishes, 1 Best Condition, and 2 Individual Bronze Medals (both in the North American Young Riders Championshipa). "He's a very motivated horse. He has quite the work ethic. When I get on him, he seems to know me: 'We have business to take care of!' " The 10-year-old gelding is, however, a handful. "I wouldn't say he's easy to ride," Steven says, "but he's a great horse, a phenomenal athlete." It's the first time Steven and his fellow Junior and Young Rider team members have ridden in international competition other than the 2011 Adequan/FEI North American Junior & Young Rider Championships in Kentucky. It is in fact Steven's first time out of the country. "We're expecting a different ball game over there. It's not going to be your normal backyard endurance ride. "But we are going over to have a good experience, absorb, see what it's like to compete internationally. We're hoping for a good race, and have our horses come out of it well." Thoughts of school and finals will be on the backburner for a week during this endurance experience of a lifetime, representing his country in the Championship. "It's really quite an honor!" What were you doing when you were 18 years old? If you're like me, you weren't doing anything half as exciting as preparing to fly halfway around the world to compete in a Young Rider/Junior World Endurance Championship, like 4 young men and women from the US are about to do. Endurance rider Kelsey Kimbler, 18, of Aberdeen, South Dakota, is one of those Young Riders. Currently a full-time student at Northern State University studying biology, she'd never heard of such an event until she was at the AERC (American Endurance Ride Conference) annual convention in March of this year. There she met Belgian endurance rider and author ("Endurance, a French Perspective"), Leonard Liesens, who talked about the Championship in Abu Dhabi on December 10, and encouraged her to work on qualifying for it. When Liesens said Abu Dhabi would pay for the travel expenses for horses and riders, the appealing idea stuck in her head. Kelsey and fellow Young Rider Kyle Gibbon decided to work towards that ultimate international competitive endurance goal, even though the idea seemed "a bit far-fetched." Implausible as it sounded, that's exactly where Kelsey is headed right now with her mom Kelly, and her older sister Kirsten's gelding, Cody Canuck. When Kirsten left for dental school this year, Kelsey took over riding Cody Canuck competitively. They completed their first ride together at this year's Fort Howes 75-mile ride in June, finishing 5th. A seasoned endurance horse with 1655 AERC miles, Cody, 14, is the Kimbler family's best horse. "He has a great work ethic... but he doesn't really care for people. He has his moments where he gets a little crazy at times, but he's really OK."
As a youngster, Kelsey remembers her older sister's infatuation with horses. "Kirsten loved horses. She had a toy horse that she played with." When the Kimbler family moved to South Dakota, Kirsten started riding at a nearby Arabian farm. Kelsey was in elementary school when she first got on a horse. Eventually, the whole family competed on the Arabian show circuit. Around this time father Carl Kimbler saw an ad for the Tevis Cup at his local feed store. Though that seemed an impossible goal because the ride was all the way across the country, the seed idea was planted in his head. The Kimblers rode Arabians. Why not endurance? Why not an objective of the Tevis Cup, the Holy Grail of endurance riders? Carl Kimbler and his daughter Kirsten rode their first endurance ride together in 2003. Mom Kelly and daughter Kelsey rode their first endurance ride in 2004. (Two more sisters have started since then.) In 2007, Kirsten was awarded the 2007 USEF Youth Sportsman's Award. Kelsey has followed in her sister's footsteps, receiving the 2010 AHA Youth of the Year, and the 2010 USEF Junior Equestrian of the Year and Youth Sportsman Charter Overall awards. Kelsey also won the 2006 and 2008 AERC Junior National 100 mile award for completing the most 100-mile rides of any Junior in North America. In 2006, at the age of 13, Kelsey and her dad finished their first Tevis Cup together. Kelsey's second Tevis Cup finish in 2010 was one of her most memorable rides, ever. "My sister Kirsten and I planned to ride together the whole ride and finish as high up as we could, because our horses were in great shape. But Kirsten was pulled at the first vet check, and as I needed a sponsor (in Tevis, Juniors under 18 must ride with a sponsor), I kept getting new ones, because they kept getting pulled. In all, 5 of my sponsors were pulled, and my last sponsor was Barbara White. ** It was crazy how things turned out to be. I got to ride the last miles and finish with Barbara [the year Barbara received her 30th Tevis buckle]. I would never trade that experience for anything!" Kelsey is an experienced rider, with 3345 AERC miles and 13 100-mile completions to her credit. And while Kelsey has competed in 4 National Young Rider endurance rides (winning and receiving Best Condition in 2009 on Junior CAHR), she is looking forward to the unlikely idea that has come a reality - her first overseas ride and first World Championship, and another most memorable endurance experience. **Barbara White is a Tevis legend, with a record 31 finishes. It's probably safe to say that just about anybody would be honored to ride with Barbara! 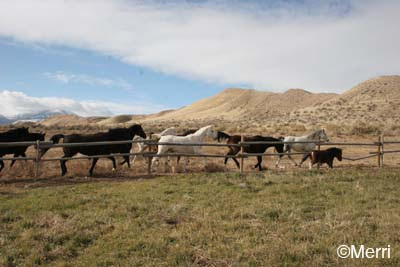 Occasionally, neighbor Linda goes jogging, and takes her Owyhee Menagerie with her. 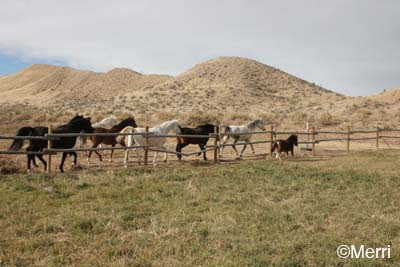 Occasionally, the mini-mule mare gets into somebody's random pasture (by crawling through or under the fences) and stirs up the locals and either can't get out, or pretends she can't get out because by running around, back and forth along the fences, the locals stay stirred up and she stays the center of attention. She always manages to find her way out of said paddocks when she really wants to. until I finally opened the gate, and she slipped out, and headed for home. I recently discovered that it's official: JOSE AND I WON A 2nd PLACE AERC AWARD!!!!!!!!!!! This momentous occasion coincides nicely with all the talk lately on the AERC forum and Ridecamp on Endurance.net about mileage and the sport of Endurance riding, and what exactly is "Endurance," and the recognition and awards associated with the sport. There have been lively discussions on what actually defines the sport of Endurance. The AERC bylaws in 1974 said "The term endurance riding is defined as an athletic event in which the same horse and rider cover a measured course (usually 50 to 100 miles)..." Rides under 50 miles (i.e., 25 to 35 miles) are called "LD" or "Limited Distance." That brought about some elitism, or perceived elitism by some riders, though we all know that some days, just saddling up your horse and riding down the block and back on a blustery day on a goosey horse constitutes the most bravest form of endurance there is. The entire membership does agree that we are all slightly crazy to do what we do, whatever the distance we ride. would, on a few rare occasions, allow an equine that is very close to reaching its 5,000 mile plateau (and the accompanying 5,000 mile blanket) the opportunity to use any LD Miles it had to count towards the total gross mileage. It has been suggested that, if AERC did combine mileage, the blankets or other similar recognition could include verbiage on any award to be one of the following, "5000 Endurance Miles" or "5000 Combined Miles"." • A myriad of Regional Awards (for each of 9 Regions) for horses and riders and both - and in each, for each of 4 Senior weight divisions and a Junior division. These can be in the form of certificates, plaques, patches, jackets or vests, horse blankets. Some people prefer to keep the sport of endurance along the lines of its original form and purpose; some people prefer to reach out to a broader spectrum and attract new members by combining mileage and adding extra awards. Some people feel we already have way too many awards handed out. Some people think we don't have enough, and the more awards the merrier. I say: Endurance riding should be fun. It should be a challenge for you and your horse, one you can accomplish successfully and safely while HAVING FUN. Here in the US (and Canada), Endurance IS fun. It is a family sport. It is a sport where you can choose a myriad of goals for yourself and your horse. You can ride 50 miles by yourself. You can ride 25 miles with a big group. You can ride 100 miles with your 5-year-old kid. You can ride with a Raven. You can ride 25 mile rides forever and never choose to ride further. You can ride only 100 mile rides. You can ride multi-day rides. You can ride just to see some spectacular country. You can ride to win rides in your region. You can ride just to finish and to accumulate miles for yourself or your horse. You can try to chip away at Dave Rabe's 53,000 miles (good luck with that!). You can ride almost 4000 miles in one season. You can ride one 25-mile ride a year or one every 10 years. We'll still say Hi and We're Glad To See You Again when you come back. You can aim to win the Tevis Cup and Haggin Cup in the same year. 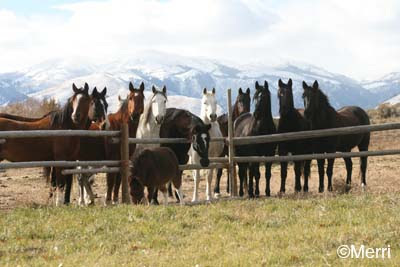 You can aim to make the US Team and represent your country in the World Equestrian Games. You can participate in endurance here however you want. In most countries of the world (excepting Australia and Canada), you do not have those choices. In most countries of the world, endurance is not something one would call "fun." It is a business, and your goal must be to win. You don't get 12 hours to complete a 50 mile ride and you don't get 24 hours to complete a 100 mile ride. You can count the number of multi-day rides in all the other countries combined on your toes. You don't have horses who regularly go 10,000 miles, or 5000 miles, or even 3000 miles. They are lucky to go 3 years, and then it's always fast. In the US we don't care what you wear or if your horse is brushed or if you wear a 3/4 inch heel on your polished boot, or if you have a collared shirt on (unless you choose that option, which is a choice you have here!). When it comes down to it, we really don't care what distance you prefer to ride, or if you don't move up to longer distances, and we don't really care how many miles you have. As long as you just ride. And if you can't ride any more, you're still an Endurance rider. Endurance as a whole is not as snooty and pretentious as other horse sports, mostly because we aren't all trying to win and we have so many different goals we can aim to accomplish. It's really about the horse, and horsemanship, and it's about FUN. And if it's not about fun for you, that's also your choice, here in the US. I say, the more people who can enjoy and appreciate this sport and their horses at all levels and distances, the merrier. And in the US, we give awards for a lot of things. And this year, for the first time ever in 12 years of riding endurance, I'M GETTING ONE OF THOSE! But to be more concise: Jose and I finished second in the point standings (I don't even know what points are! And I don't care!) in our weight division (out of 4 weight divisions) in our Northwest division (out of 642 members), out of 9 US divisions and 5328 total AERC members, out of 312,631,171 human beings in the US of A. Not really a big deal if you look at it that way. Sure, I could have gone and gotten my own vest and had my name and Jose's name embroidered on it. But really, that's not the same thing as my AERC endurance organization awarding me this vest with mine and Jose's name on it. Would I still ride endurance if AERC did away with all the awards and recognition? Sure I would. In the Grand Picture of the World, my vest means nothing to anybody but me and Jose. I once would have said that all those Awards aren't that important - who's going to remember or care next year (or tomorrow), or know what it means, that Jose and I finished second Featherweight in the Northwest Region of the AERC in 2010 - but now that *I'M* getting an award, all I have to say is, once I get my vest, it will be on my back, around Jose's neck, in your face - I won't be taking it off! Snow dusts the Owyhee mountains. Cold winds blow down the canyons. 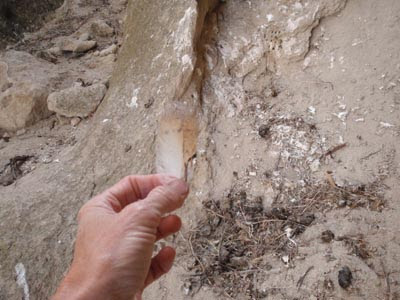 Hair grows thick and soft on horse hides. Bellies expand. The winter fat builds up. The endurance season in the Pacific Northwest is over for the season. Time to hang around the hay feeders and eat. Time to sit around the campfire and munch carrots and roast oats and tell the season's ride stories to their herdmates. They aren't even running down from the canyon like they often do. Snow, cold, lazy days, lazy horses. 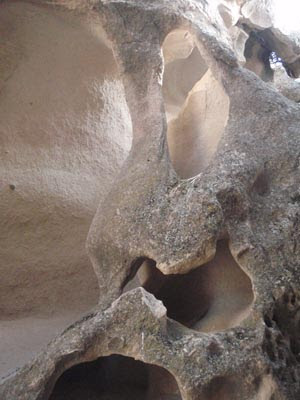 They look quiet and deserted, these Wind Caves, but eyes are always watching you. 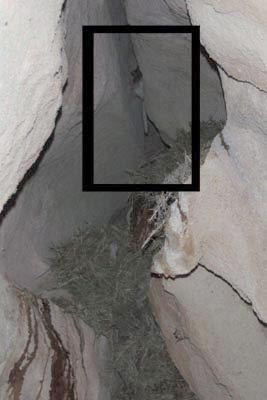 Who knows what magical creatures inhabit the tunnels and caves when humans can't see? 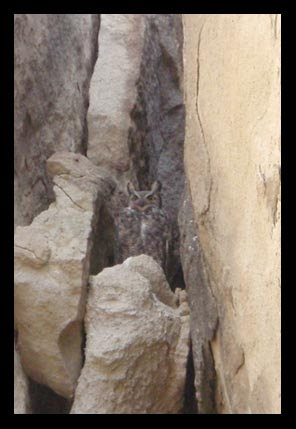 She's still here, the Great Horned Owl, the queen over her fairy tale domain, camouflaged in the cliffs, fearless, untouchable. Watching, but unseen by most humans, though she leaves clues all around. where she sits and eats and leaves the bones and feathers and undigested pellets behind. Sometimes she dines on her terrace-with-a-view. 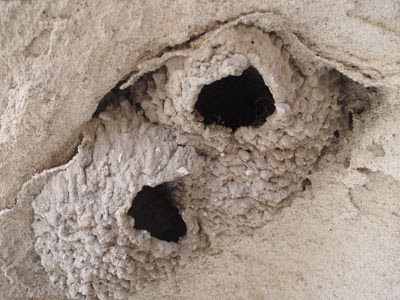 The swallows build their mud nests on the walls, hiding inside their lairs while watching outside. 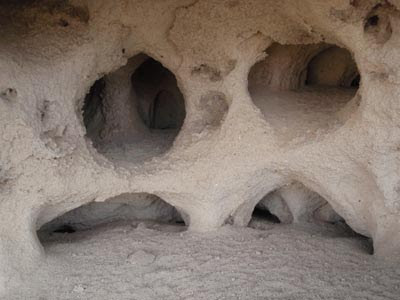 burying down in the nests, or clinging to the walls when a human ventures too far into their hideout. 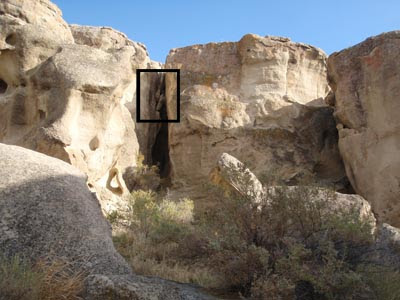 They look deserted, these marvelous carvings and sculptures of wind and water, but the eyes are always watching, in the hidden Owl Grotto in the hidden Wind Caves in the Owyhee desert. It's not often a farm celebrates their golden anniversary, but Holly Farm of New Zealand is doing just that. It was 1864 and six generations ago when David Marshall's Scotch ancestors emigrated to the South Island of New Zealand and bought the land that is still Holly Farm today. "the Queen of Crabbet Park," a champion at the Richmond show and foundation mare of the famous Silver line, Silver Sparkle had been bred by the renowned Lady Wentworth of Crabbet Park in England. Over the years, David has followed his father's tradition of acquiring select Arabians with classical clean lines and the athletic ability to perform to include in Holly Farms' breeding program, “to ensure that a suitable horse is maintained for the pleasure and use by anyone who appreciates the highest unique qualities found only in the Arabian breed.” The Holly Farm get has been and continues to be successful in the showring and on the endurance trails. In celebration of Holly Farm's 50th anniversary and its contribution to the world of Arabian breeding, showing, and endurance riding, David Marshall has donated a breeding to either Zaddam or Pradaa as a fundraiser towards the efforts of the Mt Nimrod Club, hosting the first FEI World Qualifying Series for New Zealand towards the 2012 World Endurance Championship in Great Britain. 9-year-old Zaddam (by Anwar Sadat x HFA Mazriah) is half Crabbet, half Egyptian Arabian. David showed him as a yearling and as a 2-year-old, both times winning "A" class Supreme Championships. As Zaddam's career progressed, he won Champion Ridden and Champion Costume, and is also a CEI* level Open Endurance horse. His progeny have already been successful in the showring and will soon be tested as endurance horses. 11-year-old Pradaa is a Russian stallion (by Naazim x GG Sasha). Naazim is a half-brother to Naaddel, who was purchased by Lester Marshall and introduced to the Holly Farm breeding program in the 1970's. Naaddel was awarded the Roll of Merit for his successful, winning progeny. Pradaa is the sire of the first foal (out of HFA Mazlinta, from the Silver Fire line), born in October, of Holly Farm's 50th season. "This breeding is donated to the Mt Nimrod Club who have gone way and beyond to support our sport of Endurance, and putting forward a full and complete schedule of CEI and CEN rides, which truly reflects what is possible," David says. "An inspiration, thank you." The ride will be held 11-13 November. Contact Wendy Farnell for more details at jondy.tnc@xtra.co.nz. 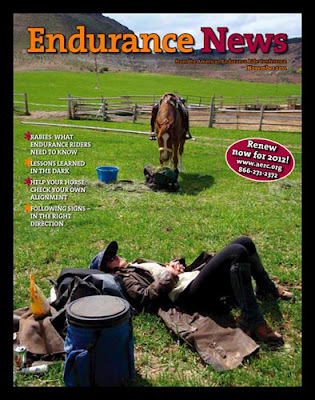 That's my photo on the cover of this month's Endurance News magazine, of my friend Nance and her horse Jasbo (LJ Jasuur Haraka) during a vet check at our May Owyhee Fandango 100 miler. Nance has over 8000 endurance miles, Jasbo has over 4200 miles (and he was bred by crick neighbors Rick and Carol of Lost Juniper Ranch! ), and they have two Tevis buckles together. 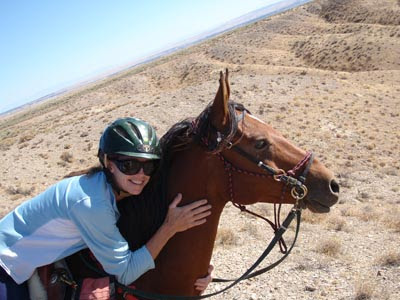 I rode Jasbo on his very first 50-mile endurance ride in Death Valley in 2005. I also remember him dumping me once while riding him around here when he was 4 or 5. I'm not sure if he's ever gotten Nance off, but he can still be a stinker! But a lovable one. And a tough one! I thought it made a great picture, Jasbo eating contentedly while Nance took a little doze in the sunshine.